THE HAGUE, The Netherlands, November 24, 2000 (ENS) - The sixth largest insurance company has warned that damage to property due to global warming could bankrupt the world by 2065. Dr. Andrew Dlugolecki, director of general insurance development at CGNU, told delegates attending the international climate change summit in The Hague that the rate of damage caused by changing weather will exceed the world's wealth. CGNU is a top five European life insurer and the United Kingdom's largest insurance group. "Property damage is rising very rapidly, at something like 10 percent a year," he told a briefing at the 6th Conference of Parties (COP 6) to the UN Framework Convention on Climate Change, yesterday. "We've still not yet really begun to see the effects of climate change in the West. What we are seeing so far is largely the result of more people living in areas which are becoming more dangerous. But once this thing begins to happen, it will accelerate extremely rapidly, as the IPCC report makes clear." Dlugolecki contributed to a Intergovernmental Panel on Climate Change (IPCC) report due out next year. The IPCC consists of more than 2,500 scientists from around the world, and its first assessment report in 1990 was used as the basis for negotiating the United Nations Framework Convention on Climate Change (UNFCCC). Dlugolecki said that the current rate of growth of damage of 10 percent a year will exceed Gross Domestic Product by 2065. He added that the insurance industry was in danger of "running out of money," to deal with the disasters. "This stark warning must help focus the minds of everyone sitting round the negotiation table at the climate summit," said Mark Johnston of Friends of the Earth. "We've all seen the storm warnings, now we are being told the financial forecast. These talks must not fail to produce a deal that will prevent future climate chaos." Integral to the Carbon Budget Analysis Tool (CBAT) developed thereafter, is full analysis of positive feedback rates where climate damage-rates exceed the rates of growth per se. This effectively starts mapping positive feedback in the financial system onto the climate system, creating the dangerous dynamics of runaway rates of climate change - 'the monster in the model'. Dlugolecki proposes a more radical approach to climate change than is being discussed at COP 6. The concept, known as contraction and convergence, has long been promoted by the London based group the Global Commons Institute (GCI). GCI describes itself as an independent group of people whose aim is the protection of the 'Global Commons'. It fears the world may be driven beyond the threshold of ecological stability by the relentless pursuit of economic growth. The 10 year old group has proposed a contraction and convergence framework under which all countries are allocated tradable quotas of a global emissions budget. As the global budget contracts the distribution between countries gradually converges, reaching equal per-capita levels. Put simply, carbon dioxide and other greenhouse gases caused by human activity must be cut drastically, but every country should have an equal right to use the fuels which emit carbon. Huge cuts in emissions from developed nations should allow a corresponding emissions rise from developing countries. In projections, GCI suggests 2045 will be the year of convergance. It says population forecasts could become critical and be the subject of negotiation. "However, it could be counterproductive to create an incentive for countries to increase their share of the global emissions budget through population growth," says CGI. "We suggest that a starting position should be that Annex One countries are treated as stable from 2000 forward, and that non-Annex One countries are treated as stable from the Convergence year (2045) forward." Annex One countries are the 38 industrialized countries, plus the European Union, committed to making cuts in greenhouse gas emissions under the 1997 Kyoto Protocol. to this enquiry by the . . .
10.1 Setting targets will have a mildly beneficial effect only in terms of international negotiations, unless and until UK’s actual progress on emissions is more impressive. Recently, it has fallen oV, and can hardly be regarded as a shining example. The real progress was made before 2000. 10.2 Adopting the policy of “Contraction and Convergence” would materially strengthen UK’s international position, since it would put set the UK’s actions in a global context. “An agreement on global policies to tackle climate change is urgently needed for many reasons. In the first place, evidence is accumulating that the climate system may be more sensitive than we believed even in the recent IPCC report. At the same time, there has not been much progress in putting a systematic halt to emissions, so the problem will get worse. The agreement needs to include credible, strong, phased targets for emissions leading to a global reduction of 50 per cent by 2050; otherwise the price of carbon will be too low to incentivise a change in mindset. The fairest way to share these is the Contraction and Convergence model, which leads to equal emissions percapita in every country." "Many scientists believe that an atmospheric level of 450 ppmv (parts per million by volume) of carbon dioxide should be the initial target for prudence; already we are at 380. For long-term allocation, the “Contraction and Convergence” model (C&C) seems appropriate. The name C&C reflects the facts that the annual emissions contract to a safe level, and the per capita shares converge to become equal. 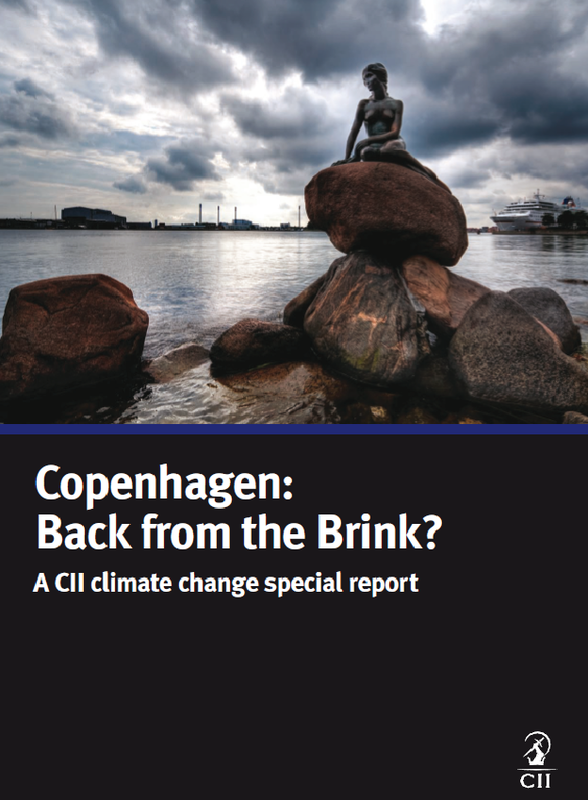 C&C has the advantages of simplicity and fairness, gives long-term confidence in emissions reduction and in the short-term can accommodate a variety of ‘fixes’ as well as facilitating the flow of funds to developing countries." 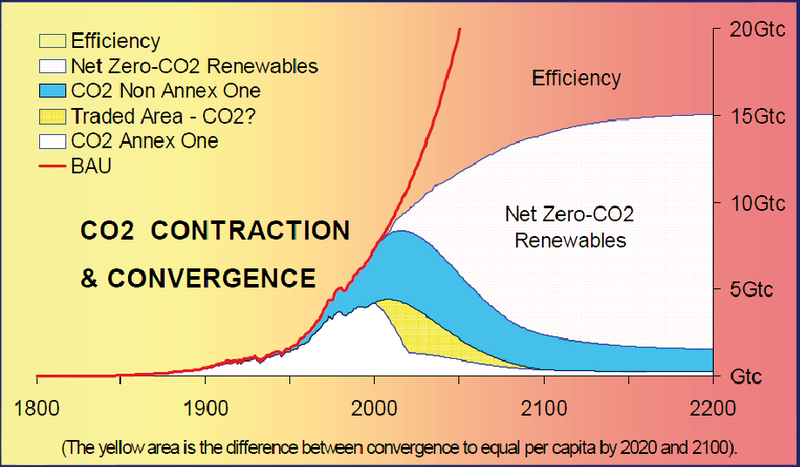 The most realistic way to bring about the required reduction in ghg emissions (which will have the combined effect of reducing the damage imposed on the insurance industry and encouraging the transition to renewable energy) is that proposed in the concept of Contraction and Convergence (C&C). This concept was created by the Global Commons Institute (GCI) and is incredibly simple in its detail. Essentially, everyone has the right to emit an equal amount of pollution (in this case CO2) to the Global Commons (atmosphere). At present society emits six billion tonnes of carbon a year (6Gtc) to the atmosphere. Coincidentally there are six billion people alive today, hence everyone should be entitled an equal right to emit 1 tonne/yr. To achieve the required global reduction in ghg emissions an agreed target of say 2Gtc by 2040 could be set and the system allowed to contract to that global budget by converging on an agreed per capita allowance. Those states that need to emit more than their share will have to buy emission entitlements from those that have an excess. This would operate in much the same way as the envisaged emissions trading scheme to be set up within the Kyoto Protocol. Figure 10.9 - The red line shows Business as usual CO2 emissions (BAU). The solid segments show ‘Contraction, Convergence, Allocation and Trade’ to manage emissions down by at least 60% within a given time frame and ‘contraction budget’. The renewables opportunity is worth trillions of dollars, the biggest market in history. Annex One is the developed World. Gt C: billions of tonnes of carbon equivalent. Figure 10.9 illustrates this process, showing that by the year 2100 emissions will have fallen to well below today’s levels, and will emanate from what are, today, developing countries. Since economic progress is dependent on energy, the shortfall from ‘Business as usual’ energy consumption will need to be met from two directions: efficiency gains, and a rapid growth in renewable energy sources. It is clear from this that emissions trading can only be an intermediate stage, since the total volume of emissions must fall. The only blockage to this simple system is the absence of political will to ‘step outside the box’ instead of conducting a tortuous round of negotiations of the Kyoto Protocol. One way to unblock this impasse is to amass a large enough consensus of stakeholders behind the concept of contraction and convergence, persuading governments to supersede the Kyoto Protocol. The insurance industry is an obvious place to start such a campaign as it has so much to lose and so much to gain. If society continues down the fossil/Kyoto route, future economic losses are likely to become unsustainable: the current rate of increase in damage from natural hazards is 12% pa and the rate is accelerating. Given that the global sum of such losses was $100bn in 1999 (Munich Re, 2000), it would outstrip global GDP (growing at 3% pa) by 2065, if the trends persist. If the insurance industry rallies behind C&C, it not only reduces that risk, but it is well placed to invest in the future renewables market. In fact one could argue that as the insurance companies own the oil companies (through equity ownership), insurers form the only industry that has the collateral and the need to adopt the C&C logic. The desired sequence of events is shown in Figure 10.10. 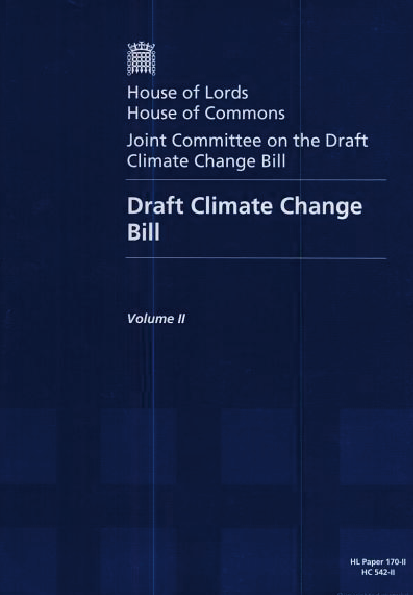 This DVD was produced on behalf of the UK House of Commons All Party Parliamentary Climate Change Group of MPs (APPCCG) by GCI and Tangent Films. It was distributed to all sitting UK MPs in 2007. It points to the disciplined approach we need to address climate change. Not an approach based on wishful thinking, but a rational framework which leads to the solution foreshadowed in the original 1990 United Nations Framework Convention on Climate Change (UNFCCC), and subsequently much ignored. The UNFCCC called on all countries to recognise their equal but differentiated responsibilities to cut carbon emissions, and to recognise that the eventual equitable distribution of carbon rights had to be achieved. Over 180 countries signed up to the UNFCCC's aims, but have so far failed to deliver the action necessary to achieve them. Time is now running desperately short. 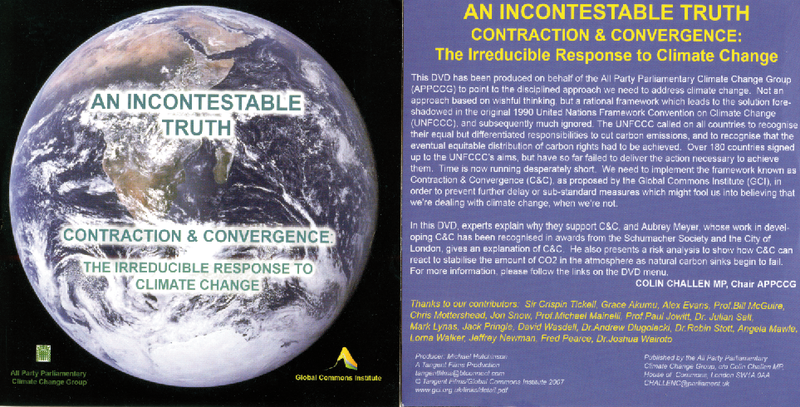 We need to implement the framework known as Contraction & Convergence (C&C), as proposed by the Global Commons Institute (GCI), in order to prevent further delay or sub-standard measures which might fool us into believing that we're dealing with climate change, when we're not. Thanks to our contributors: Sir Crispin Tickell, Grace Akumu, Alex Evans, Prof. Bill McGuire, Chris Motters-head, Jon Snow, Prof. Michael Mainelli, Prof Paul Jowitt, Dr. Julian Salt, Mark Lynas, Jack Pringle, David Wasdel, Dr. Andrew Dlugolecki, Dr. Robin Stott, Angela Mawle, Lorna Walker, Jeffrey Newman, Fred Pearce, Dr. Joshua Wairoto. It is important to recognise that any agreement can be only the first step in what will be a major journey. It is clear that even if the Kyoto targets are met, global emissions will continue to rise because of rapidly rising emissions in the developing world. Substantial further steps will have to be taken to curb emissions globally. Such cuts will inevitably begin to involve poor countries and at the same time rich countries are likely to have to commit to much more serious emission reductions themselves. As a result further emission reduction agreements are likely covering the period 2012-20 and beyond. 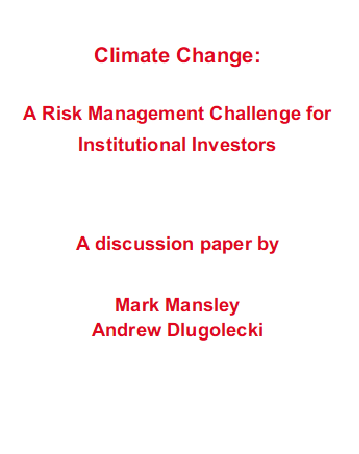 Climate change: a risk management challenge for institutional investors Indeed, the IPCC in its first assessment reports in 1990 recommended emissions cuts of at least 60% to stabilise CO2 concentrations at 1990 levels and thereby be likely to avoid serious climate disruption. Its subsequent reports have not altered this position. In the longer term, ‘Contraction and Convergence’ (C&C) is likely to become increasingly supported as a policy option. 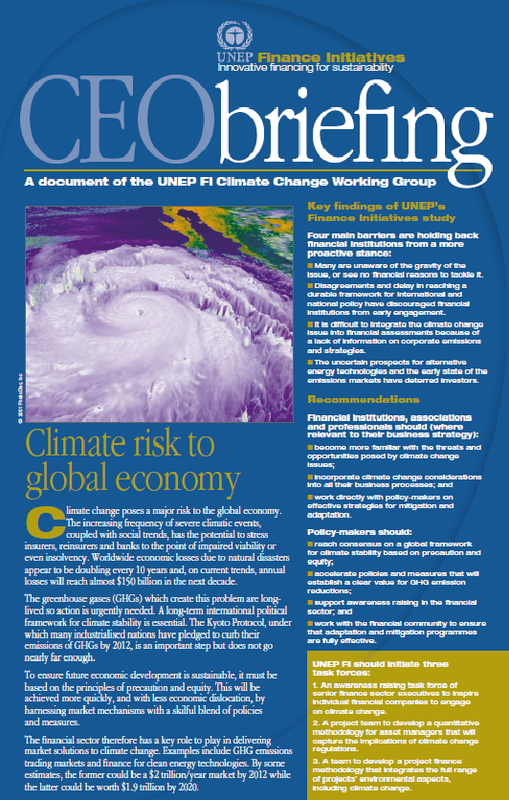 C&C was initially advocated by a small UK think tank, the Global Commons Institute39, but has since gained widespread and authoritative support, including that of some poor country governments and also the recent Royal Commission on Environmental Pollution report which recommended that ‘the government should press for a future global climate agreement based on the contraction and convergence approach’. Under C&C, the right to emit greenhouse gases would be apportioned on a per capita basis from a given date. The total amount of emissions would be constrained and would fall steeply until it reached a level considered safe. Since the majority of the world’s population lives in the developing world, while per capita emissions are much higher in the industrialised world, rich countries would need to find ways to reduce their emissions 'contraction' by finding efficiencies or renewable energy sources in the next few decades, or pay handsomely for the privilege of continuing to use fossil fuels. In this way they could approach equal per capita emissions to those in other countries convergence. Ironically, while C&C offers a more robust framework than that outlined by Kyoto and addresses the issue of equity, it also meets the fundamental objection of the US in that it also requires commitments from the developing world. As a global operational framework it also avoids many of the technical problems of Kyoto (such as defining baselines for emissions trading in countries not subject to an overall target, or the extent of international emissions trading that is permissible). However, much will depend on the detail. Done well, C&C could provide a framework for a genuine, equitable, long term solution to climate change, which reduces political risks and provides businesses and investors with the sort of predictable framework they prefer. But if agreement is hard to reach, C&C might serve to highlight injustices and end up exacerbating tensions. For example, some campaigners have argued for a third ‘C’: ‘compensation’ from the rich world for using up the climate’s absorptive capacity. Whilst this claim is understandable, such a development could well become an emotive issue that could make agreement far harder to reach. 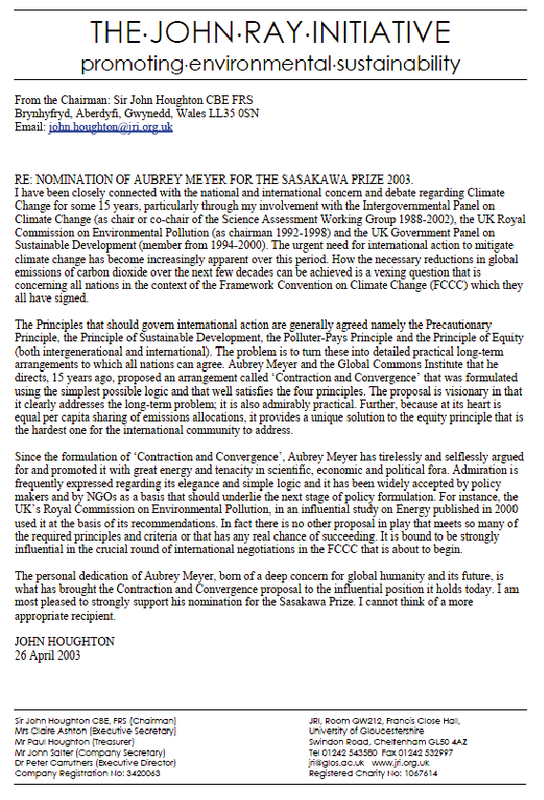 Aubrey Meyer's insight into the problem of mitigation of climate change bears the true hallmark of genius: it is simple and robust. His "Contraction and Convergence" model provides a transparent framework that incorporates the clear objective of a safe global level of greenhouse gases, AND allocates the responsibility for achieving this internationally with the irresistible logic of equal shares. At the same time, the model recognises the practical need for an adjustment period to permit nations to conform to the new logic and prepare for a climate-friendly economy. It is no doctrinaire solution, but a brilliantly pragmatic and elegant solution. Aubrey and his tiny organisation GCI, have laboured tirelessly to bring the concept to every conceivable stakeholder's attention, from governments to NGO's, to the business world, in which I operate. Too often, mitigation is portrayed as being detrimental to economic development. Aubrey has demonstrated through his brilliantly simple graphics, that in fact mitigation is the guarantor of wealth creation, not its nemesis, and that market forces can accelerate the transition to a safer climate. This is a key message in mustering the support of the business world, and already the UNEP Finance Sector Initiative has commended "C&C" to policymakers as a basis for negotiation. In the forthcoming discussions on how to follow up "Kyoto" with more meaningful action, surely Contraction and Convergence will be the pivotal proposal that reconciles developing and developed nations' ambitions. It is only fitting that Aubrey Meyer should be recognised for creating such a seminal concept, and promoting it so effectively. If the most probable greenhouse predictions come true, the present problems will be magnified dramatically. Changes in many atmospheric processes will significantly increase the frequency and severity of heat waves, droughts, bush fires, hailstorms, floods and maybe also tropical and extra-tropical cyclones as well as storm surges in many parts of the world. . . . It also stands to reason that the particularly destructive tropical cyclones will advance into regions where they have not appeared in the past because of the temperatures prevailing there. Likewise the extra-tropical storms, the so-called winter storms, will penetrate far into the continents more frequently because the lack of snow will reduce the blocking effect of the cold high-pressure system over eastern Europe. (Berz and Loster 2001, 1) From all of this they draw a simple conclusion: “We simply cannot be responsible for leaving future generations on this planet with a climate that is out of balance” (Berz and Loster 2001, 2). 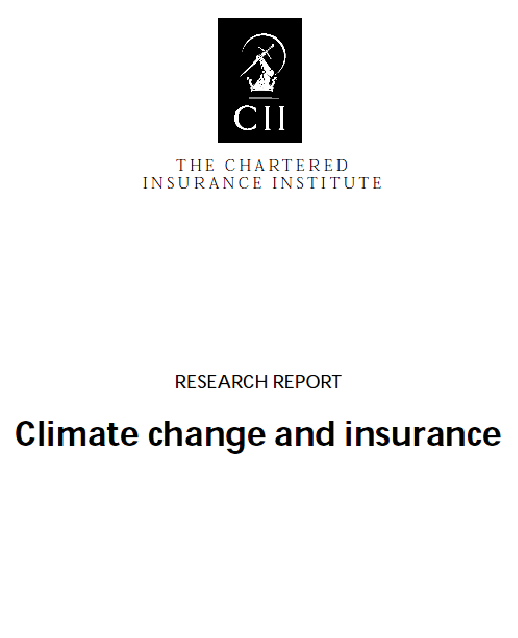 Another important figure in the insurance industry who has worked to bring the evolving scientific knowledge of climate change into the public forum is Dr. Andrew Dlugolecki, retired director of General Insurance Development at CGNU in the United Kingdom. 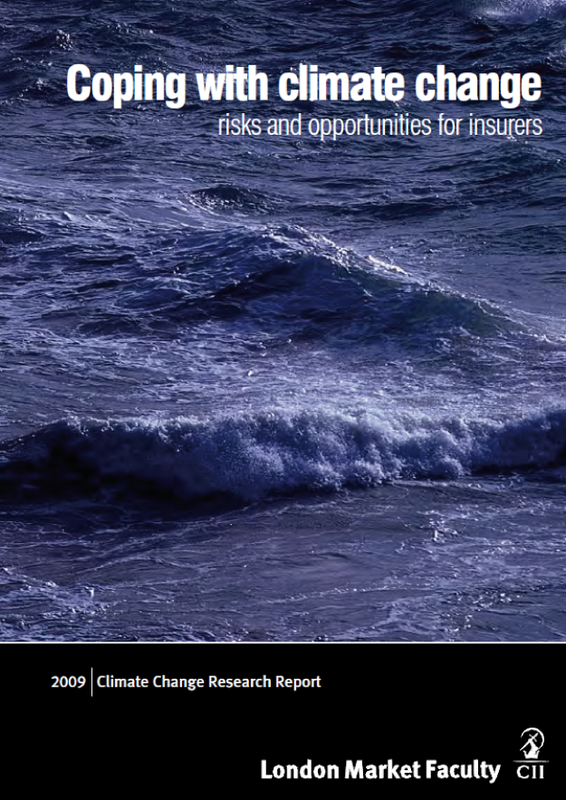 Concern about climate change was first brought home to the U.K. insurance industry by the winter storm of 1987, which, with hurricane-force winds, inflicted 1 billion of insured losses in 24 hours, the first event ever to do so. As one of the few business members of the United Kingdom Climate Change Impacts Review Group (most being from the university or government), he was responsible for the financial sector of the Group’s report, The Potential Effects of climate Change in the United Kingdom, to the government (Parry et al. 1991). He went on to develop the financial sector of the IPCC’s Working Group II on Impacts, Adaptation and Vulnerability (Watson et al. 1996). He brought the issues back to the U.K. financial services sector in reports on The Impacts of Changing Weather Patterns on Property Insurance (Dlugolecki 1994), the Government Review of the Potential Effects of Climate Change in the United Kingdom (Dlugolecki 1996b), and Climate Change and Insurance (Dlugolecki et al. 2001). At COP 6 at the Hague he warned the conference that an exponential rise in natural disaster losses could bankrupt the global economy, and that the aims of the Kyoto Protocol were merely “tactical” (Dlugolecki 2000). 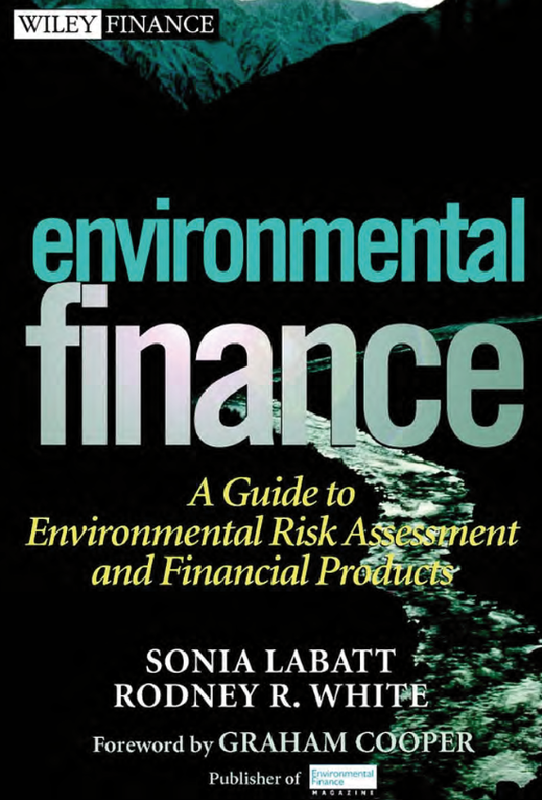 He advocates the adoption of “Contraction and Convergence” as the best long-term framework to control climate change, and has underlined the key role that investors can play in the move toward a sustainable energy economy (Mansley and Dlugolecki 2001). The real threat is probably from a cluster-in-time of extreme events which might exhaust the reinsurance protection and channel back the bulk of later events to the primary insurance market. (Dlugolecki 1996b) Dr. Dlugolecki recently retired from CGNU and became a Visiting Fellow in Climate Change and Insurance at the Climatic Research Unit of the University of East Anglia. He is also director of the Carbon Disclosure Project and the Tyndall Research Centre for Climate Change. I fully support the logic of the GCI C&C proposal. It is fair and transparent, and should be the prime mechanism for achieving a stable and safe climate. I like the additional twist in its application, whereby the convergence date can be different from the contraction date. I also like the suggestion that for simplicity, regions could group together, as the EU has done, to achieve a faster negotiation. Using $100 per tonne as an example - this figure needs to be qualified heavily, and will be of course a product of the marketplace over years. There is also the issue of historical responsibility differing between countries, which could be dealt with intra-regionally of course. Finally, my own twist, which is that this in fact the Second Anthropogenic Global Warming: - the first was due to farming, and so implicates many developing countries and means that the Industrial (Second) Warming took off from a higher platform. One could argue that responsibility should be shared between both.